About Cüneyt A. Message Cüneyt A. 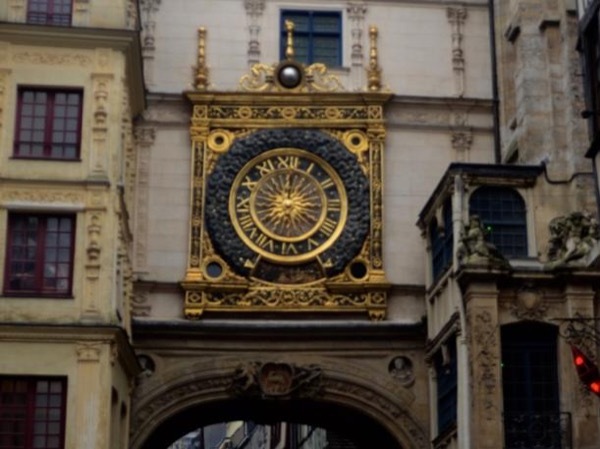 From Paris to Rouen "The medieval city"
This was a great tour of the city and its hidden treasures steering clear of the more popular sites and finding those hidden places we did not know we wanted to visit. He truly made us feel a part of the city and the day to day life that was taking place all around us particularly as we sat in the cafes having coffee or sharing lunch. The guide helped us organize the future days spent in the city to assure we experienced all that Paris had to offer from places to visit to where to eat and what to order. TOUR GUIDE RESPONSE: Thank you very much for your nice comments. Hope to receive you again in Paris or any other nearby city. Cuneyt waited for us for over an hour at our hotel. When we finally arrived, we worked out what we wanted to see. As this was our first trip to Paris, he took us to the Eiffel Tower, taught us to use the Metro, and gave lots of advice about what we should do in the next few days. We had flown in on a red-eye, so we were tired way more quickly than he was! We learned a lot and it has made our trip more enjoyable. Thank you! Amazing guide. We had a fantastic time walking all over Paris. He was extremely accommodating and very knowledgeable. We would love to see him again one day. Cuneyt is wonderful. I had the Paris for Beginners tour on Sept. 15, 2018. While walking together, Cuneyt tell me a lot of history, culture and how the Parisian live in this most romantic City in the world. I travel solo but I feel like I was walking with a local friend. I highly recommend this tour for people who are visiting Paris with only one or two days. In the end of this tour, Paris is no longer a new place to me. TOUR GUIDE RESPONSE: Great to hear this Andy. It was wonderful for me being with a friend from China, my old place. Hope to receive you again in Paris. Cuneyt is an extraordinary guide with a perfect English domain. We had enjoying the tour and the company. One more time using ToursByLocals has been the right thing to do. My wife and I are enchanted with the service and the reliability of the guides. Cuneyt was remarkable! We certainly walked a ton but the education and sights of Paris were amazing! We got to see and learn much about the current culture as well as history of Paris through visitation of both landmarks and quaint sidestreet discussions. Outstanding tour by Cuneyt and can't wait to come back!! TOUR GUIDE RESPONSE: Thank you for your kind comments. Hope to rcv you again in Paris. Although Cuneyt was pleasant and punctual, we didn't get much out of the tour. We didn't feel that he understood Jewish history in France. Cuneyt was extremely well prepared and a joy to enjoy the sights of Paris with. I own Le Gourmet Connection and needed to understand the Paris food scene to search for new products to add to my business. He had researched the markets prior to my arrival and had specific recommendations as we toured. His general knowledge of Paris and it's history coupled with his knowledge of food and related products was extraordinary. When I return to Paris, I will certainly ask for Cuneyt as my guide. It really was such a day in Paris, both me and my sister were beyond tired from our flight the day before, but that didn't stop it from being a great day in Paris. We were shown a lot of things that we never would have found on our own, and became somewhat familiar with our surroundings so that using the metro alone became no problem the following day. We are glad we took this tour, and if we highly recommend it to anyone debating taking it! It was fun and we would totally do it again given the chance!!! TOUR GUIDE RESPONSE: Thank you for your nice comments. I am happy to see you girls are becoming parisiens. Enjoy the rest of the holiday. Cuneyt was very generous and flexible. He was prepared to give us a tour of "His Paris" but adapted to our needs for a "Paris Highlights" based on our conversation. He really knows Paris and gave us a day that will never be forgotten. TOUR GUIDE RESPONSE: Thank you very much for your kind comments. I was going to show you more but the time was limited with you. Hope to rcv you again in Paris. TOUR GUIDE RESPONSE: Thank you for the stars.. I enjoyed very much being with your parents... They are lovely people.. This was the best possible tour for us. My 16 year old daughter's first time to Paris and a dad who had not been to city in 30 years. Our guide tailored our day to us, perfectly blending well known must see sites from the best vantage points with some cool off the beaten path Paris one of a kind experiences. Cuneyt made sure we experienced the full range of food from Parisian breakfast, drinks at famous cafe, a lite lunch, ice cream, and an an amazing dinner at the Bisto D'Henri. Best 12.5 km walked ever. TOUR GUIDE RESPONSE: Thank you family Clapp it was nice to know you and it was great to make Martha happy during her first trip to Paris. She now knows what to ask her future boyfriend to be with him :-) Place Furstenberg ! Enjoy the rest of your trip. Cüneyt was amazing. He went above and beyong and we really enjoyed our tour. Highly recommend. Cuneyt was the perfect guide. He is extremely intelligent, cultured, articulate, fascinating and personable. What we covered in one day would have taken us at least a week to discover on our own and he tailored our tour to suit our needs (including making reservations for us at a superb French restaurant he knew). This remarkable man made our first trip to Paris very remarkable!! Thank to our guide and to ToursbyLocals. TOUR GUIDE RESPONSE: Thank you for your kind comments. It was great walking with you and showing you my Paris. Let's do it again soon..
We had an amazing experience with Cüneyt. While he perceptively attuned to what we were interested in he also brought unique facts and passion to our tour. The experience with Cüneyt allowed Paris of the past to come alive alongside Paris of the moment. We had a fantastic day with Cuneyt. Although the weather was dismal (cold, raining and snowing,) we had a fun day with him. He showed us places in Paris we would never have seen on our own. Cuneyt took into account the desires of all four of our children and the limited mobility of my husband to maximize what we could see and experience. His English is great, his stories entertaining and his concern for our overall enjoyment of Paris exceptional. I highly recommend Cuneyt for a guide. TOUR GUIDE RESPONSE: Thank you for your kind comments. I also enjoyed very much being with all of you and especially with your lovely kids... I will keep the picture which Camille (10) made for me with all our nice memories in Paris. This is probably the best money that we spent on our vacation. Not only was our guide incredibly informative, but gave us a perspective of the city we couldn't have had without him. He was punctual on arrival and followed our request to the T. The information that he gave us and the sites that we took in or parts of Paris we would never see. I would highly recommend this tour to anyone who is going to Paris for the first time. TOUR GUIDE RESPONSE: Dear Paul, Thank you very much dor your comments and stars. Please give my regards to your family members and also pls note that I hope to see you again in France maybe in Paris or somewhere else... All the best Cuneyt A.